“You are invited to reflect: If spiritual phenomena have been related by an incalculable number of people throughout history … shouldn’t there be some truth in what is being affirmed time and time again?” This is the question posed in Beyond Life, by Brazilian journalist Ronie Lima, who is a self-described spiritualist. Focusing mainly on events at a clinic in Rio de Janeiro called Lar de Frei Luiz, where psychic healings take place on a regular basis, Lima explains in great detail the deeper aspects of the astral world, life beyond death, mediums, séances, and other matters that may make many readers skeptical. Lima feels that he can be objective about this arcane material because he was a Christian and, later, an atheist before he embraced spiritism. 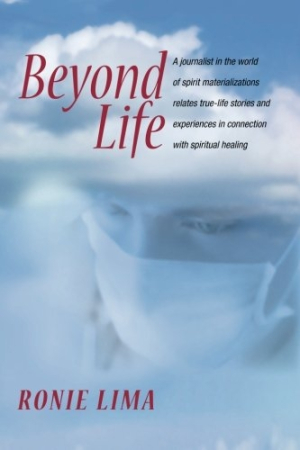 One of the more curious aspects of the hidden world cited in Beyond Life is the role of the “doctors from space.” (Lima wrote a book about these astral entities called Os Médicos do Espaço.) He claims that these ghostly but interactive beings once lived on earth; prominent among them is Dr. Frederick von Stein, a former Nazi doctor who is atoning for his sins through spiritual healing with a visible spirit body. Lima claims to have seen the doctor on many occasions. Though Lima is committed to the subject matter, writes intelligently, and demonstrates thorough research into the issues, it would be difficult for someone new to this realm to easily accept all of the ideas presented. To address the doubts that he anticipates, Lima offers many examples of cures he has witnessed during the manifestation sessions. He has seen the astral doctors heal patients by manipulating crystals, and he explains that, in special cases, “Frederick von Stein uses his bare hands to open up the patient’s body and pull out a tumor or a mass of dead cells.” These healings, the reader is told, use energies that have yet to be discovered by scientists. When Lima claims that a patient is presumably cured, he provides no scientific explanation, though in some cases he offers medical corroboration of a change in the patient’s condition. Lima’s book may not convince everyone, but it is well written and offers compelling witness to phenomena little understood in the mainstream. Perhaps, after reading Beyond Life, some readers will “have the opportunity to witness with our own eyes that…the one who died continues to be alive, only invisible,” and life goes on.